James has been going through a bit of a rough patch. After cutting his first two teeth he went back to sleeping for eight-hour stretches, but last week he started waking up four times a night. Worse than when he was a newborn! I know he’s working on more teeth but holy cow. Four times a night is just excessive. It’s excessive, James! I think he’s also going through a growth spurt because he is always hungry, and every day he looks longer than he did the day before. …my regular attitude of “Oh, you don’t have to be quiet around the baby! Go ahead and vacuum!” goes right out the window. Now, if you wake this baby up, I will murder you. It’s so sad to see him so miserable, even though he’s even cuddlier than usual. He just wants to bury his head in my neck and if I could, I’d leave him there all day. He does have a bright spot in his day, and that’s eating solids. After a few meals of rice cereal, I moved him on to veggies. We started with peas, and his faces were so over the top and hilarious. After sweet potatoes and carrots, I gave him pears and apples. He didn’t seem to like those much more, and I started to think that maybe I’d started him on foods too soon. I decided to give him the last package of baby food I had left (peas) and see how he did with it. If he was still unenthusiastic, I’d decided to move him back to rice cereal for another week. However, after a few bites, he was leaning forward to meet the spoon, and moving his jaw in an exaggerated chewing motion. It turns out the kid actually does like peas. Since then, all James wants to eat is the savory stuff. He pushes all the sweet fruits out of his mouth as if their taste is too much for him. He loves to chow down on all the veggies and can polish off a container of peas in ten minutes. I’m pretty sure Annabel is still working on her first container of peas. Peaches are not for me, mama. In the meantime, I’m dipping into my stash of teething remedies. It’s hard to see this sweet little guy so miserable. Heather…have you tried giving him some motrin? Alternate the tylenol and motrin during the day…When the third kid came around, we had motrin…it kept her sleeping, in any case and then at night, you can give both…it’s worth a try! Motrin seems to last longer. Look at it this way- Motrin is better for inflammation (swollen gums)but the way to initiate that inflammatory response is to give it regularly and sometimes slightly more (to begin with) than the recommended dose (under care of doc). Or skip the tylenol altogether and just give the motrin. If I remember right, he’s probably at a 1/2t (2.5ml). In another couple of months, he will figure out physical ways to alleviate the pain…chewing, or playing because he will be able to distract himself more. In the interim, you can get sleep. Try it, he’ll like it!! He looks more and more like the physical ‘missing link’ right between Annie and Maddie every day. I used frozen chunks of banana in a mesh bag for my two teethers and it worked nicely during the day. No overnight advice though, sorry! OMG….he looks so much like Maddie in that first picture of him sleeping!! What a cutie! Poor Baby Boy!!! Our Ped once said “There is a reason babies teeth and adults don’t….we couldn’t take that much pain”!! My daughter did not get 1 tooth until she was almost 1 & then she cut 8 at once. We were exhausted and she was always in a state of agony and exhaustion even after we were piggy backing her Tylenol and Motrin. Her Dr. eventually gave her a low does of codien(sp??) just for a week to get her over that last hump and boy were we ever GRATEFUL but not as much a I’m sure SHE was!!! I hope he feels better soon. P.S. Love his baby blues and those lashes are AMAZING!!! Reminds me of his sisters! But, I highly recommend making your own baby food. It is literally the most amazing difference I have ever seen between siblings. My youngest is not afraid to try anything – he loves my cooking. My other son, 4 years older, ate only jarred food and is the pickiest eater ever. No, it doesn’t guarantee better eating habits but if your kids get used to preservative and processed tastes they are less likely to switch to home-made tastes. It makes sense. We just used a magic bullet and chicken stock or formula (breast milk) to thin out consistency but I cooked spinach, kale, sweet potatoes, squash, brown rice, etc. He still loves veggies and humus to this day. My mom loved helping me out and would just make and freeze extra of whatever she and my dad were having….green beans, peas, soups…. Just get a few extra ice cube trays and some zip lock bags and you are set. Good luck and happy napping! I made all my own baby food the first year. My daughter still went from eating everything you put down in front of her to the pickiest of eaters. The funny part is that I’m a reformed picky eater, so I go “I should have known the whole ‘eating peas and beets and squash’ phase was just a phase!”. Sometimes it just comes down to personality: my daughter is very fussy in other ways, not just food. My son is thus far showing signs of being way more easygoing (but he’s under 3 months old, so I may be reading him wrong), so I have hopes he’ll be less of a picky eater. Again, didn’t say it worked for all but it is worth a try, especially if he isn’t into the jar food. Eat some, you will understand, bleh! Oh, I agree on that. I tried enough baby food in my prior incarnation as a daycare worker (“Yum, pea mush! Don’t you want some too?”) that I knew how terrible jarred baby food tastes before becoming a parent. The nice thing about making your own is that you know exactly what is in it. It just won’t necessarily prevent your kid being the worst eater, that’s all (we’ve had plenty of nights of “buttered noodles or else!” in the face of beautifully balanced yet tasty meals that my daughter has earned the nickname ‘the food philistine’). What’s funny is that I thought no kid could top my own streak of “pizza or burgers or GTFO” in my early youth, but I’ve been regaled with a kid who refuses both of those in favor of mac and cheese (organic and homemade ingredients, but still =/). As a friend commented on it recently “She doesn’t like PIZZA? What’s wrong with your kid?? ?” (I wish I knew. I wish I knew). On the plus side, kid willingly eats miso soup. Yeah, I just have no clue. I’ve made it before, for Annabel! Hopefully I’ll have the motivation to make it again, but until then I just buy the all-organic stuff where the ingredients are just like, “Peas, Water” or “Peaches, Water.” Once he starts eating more that will get pricey, but for now that’s all I have the bandwidth for! Did he like the kale? I am totally addicted to it but Annie isn’t a fan. I’d love for James to get on the kale train! Oh, and fruits! They taste so much better. Homemade apple sauce is the BOMB! He’s such a beauty. Hope he feels better soon! I’m right there with ya in the sleep mode. My baby girl is 7 months old, and not even a hint of a tooth coming in, but I know she’s feeling them. Oh a good night she’ll sleep in 4-5 hour stretches for me, only waking up once or twice. Last night she was up every hour, even after Tylenol. But she’s happy as can be during the day! Although often only naps in half hour increments then too I swear, I don’t think I’m ever gonna get a full nights sleep again. Hoping he starts to feel better soon! My daughter cut her first tooth a week before her 2 month checkup. She was a horrible sleeper until roughly 2, which wouldn’t you know, coincided with the last of her baby molars finally showing up. She has been a pretty good sleeper since, sleeping solid 10-11 hour stretches at night. I have never posted a comment before but wanted to pass this along. My daughter was getting up numerous times during the night for a 3 week span with bad teething. A friend of mine told me to get one of these bracelets/anklet. After about 3 days of wearing it she was sleeping through the night. Not sure if it is a coincidence or it actually helps! Good luck! I was also going to recommend the Baltic amber necklace. My 13 month d grandson has worn his since he was 6 months old. His first 2 teeth came in without it and it was horrible for my daughter and her son. He now has 8 total, working on molars and it’s much easier now. She still has rough patches with him but nothing like before. My 3 month old grandson started drooling so much at about 8 weeks and already gnawing on his hands. His shirt had to be changed at least 3 times a day because it was soaked. My daughter put in his amber at around 2 1/2 months and his drooling has almost stopped and he’s not gnawing as much. I wish I’d had these things 30 years go when my girls were babies. The amber teething bracelets are a life saver! I got mine from Hazelaid.com, and they even have a whole section on what makes them work. I wasn’t sure about having my son wear a necklace at night, so I bought a bracelet and put it on his ankle. There was one point that he was cutting 3 teeth at once and I hadn’t even noticed until I looked in his mouth. BEST. THING. EVER! He is such a doll! It’s so hard to have your baby suffer, hope you all get through this quickly!! Calmila (spelling might be off). You get it at sprouts, Walgreens, maybe whole foods. You can give up to 3 at a time. He had the most beautiful blue eyes I’ve ever seen. What a doll baby! All 3 of your babies are just so stunning. Hang in there, teething is the worst! I can’t even believe how much he looks like Maddie! Stunning to me!! I’m really posting to say that I saw Mike’s name on the byline of a BuzzFeed list that is making the rounds… the one about being a parent. I had to quiet laugh as my sick, I-will-murder-you-if-you-make-noise-and-wake-this-child-up 3 month old slept next to me…. very funny! Feel better soon Jamesie! 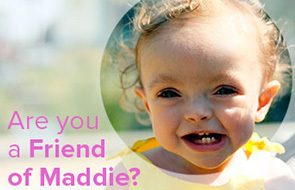 and the first pic = totally Maddie’s twin…. LOVE LOVE his eyelashes!!! I’m a Grandma of a 11 month old boy but when he was about 7 or 8 months old and teething at my place I pulled out a long carrot stick that I had previously cut from carrots and had in a bag in the fridge. Boy he loved chewing on that carrot – the edges and cold were quite soothing. But it doesn’t take the pain or lack of sleep away – just a great tether if you are going to be right there to make sure he doesn’t break any off. No advice. I cried with my babies when they were teething.